An adware application called SaleBuilder does not seem to function properly at the moment, but it does not mean that you should ignore it, if it is present on your computer. This adware application comes from a big family of semi-random name adware programs, and it poses the same system security threats as its predecessors. You should uninstall SaleBuilder from your computer because such adware programs could be easily exploited by malevolent third parties. Before you know it, SaleBuilder might lead you to serious security problems, and you should definitely avoid that. Needless to say, it is impossible to download SaleBuilder directly. These semi-random name adware applications do have official websites (in this case, salebuider.info), but they are just empty shells. Just like CutThePrice, FloorPrice, LionShopper, and many other applications from the same family, SaleBuilder gets distributed via third-party installers. It usually comes with InstallRex installer, but at times it may also arrive via Vittalia or Amonetize installers. The point is that users often download and install SaleBuilder onto their computers without even realizing that. If you often visit file sharing and torrent websites, you encounter a lot of download buttons there. Most of these download buttons are fake, and they are not related to the files or programs you want to download. However, if you click them, you automatically initiate adware or potentially unwanted software download. As a result, SaleBuilder and other unwanted programs enter your computer. 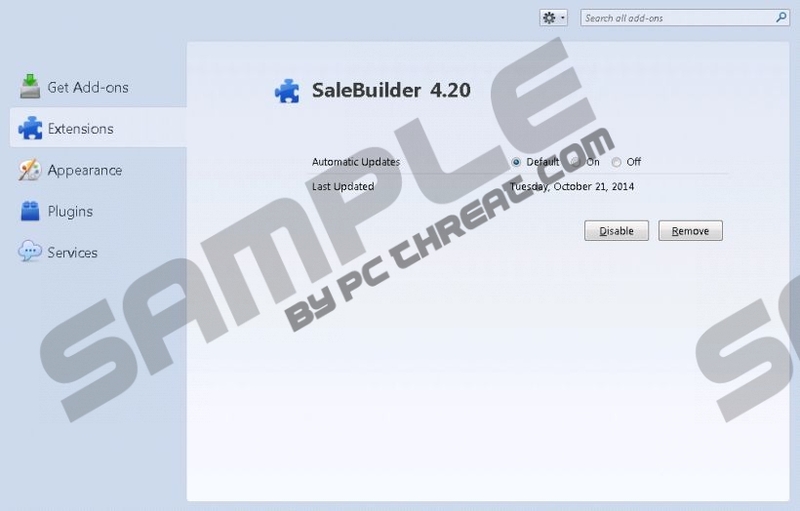 Since SaleBuilder is a semi-random name adware application, it generates its name randomly, and the entry on the list of installed programs might be SaAleBaueieledere or saalebuuiilders or any other random letter combination. What is more, SaleBuilder also adds an extension to your default browser. It is compatible with Mozilla Firefox, Google Chrome, and Internet Explorer web browsers. However, the research has shown that the newest Google Chrome versions block SaleBuilder. If you allow this program to remain on your computer, sooner or later SaleBuilder will start displaying various commercial advertisements. This program collects data on your web browsing habits and then uses that information to generate pop-up ads that would be related to your likes and preferences. It is supposed to increase the possibility of you clicking SaleBuilder ads, but you should know better than to do that. Clicking SaleBuilder ads might redirect you to unfamiliar and potentially malicious websites. You need to ensure that your system remains safe and clean, so NEVER click pop-up ads from unknown provider. Delete SaleBuilder right now, and then scan the PC with SpyHunter free scanner. You are bound to find more unwanted applications on your computer, so you have to terminate them all in a go. If you encounter any difficulties while trying to remove SaleBuilder, please leave us a comment below and we will reply as soon as possible. Open Uninstall a program and remove SaleBuilder. Go to Uninstall a program and remove SaleBuilder. Select Add or remove programs and uninstall SaleBuilder. Disable and remove SaleBuilder from Extensions. Open Extensions and remove SaleBuilder. Quick & tested solution for SaleBuilder removal.